Converted for naval service at Todd-Shipyards, Corp., Hoboken, N.J. Transferred to the War Shipping Administration, 3 July 1946, for disposal at the National Defense Reserve Fleet, James River Group, Lee Hall, VA.
four Diesel-drive 270Kw 220V D.C.
one Diesel-drive 300Kw 120V/240 D.C.
George Barnett--born on 9 December 1859 at Lancaster, Wis.--entered the Naval Academy in June 1877 and graduated in 1881. Following two years of sea service as a naval cadet, he was appointed a second lieutenant in the Marine Corps on 1 July 1883. After duty at various marine barracks on the east coast, as well as three years in Alaskan waters on board Pinta, he advanced to first lieutenant in September 1890 while serving in the steam sloop-of-war Iroquois. Lt. Barnett then served at the Marine Barracks at the Washington Navy Yard until June 1896 when he went on board the receiving ship Vermont in New York City. He reported to San Francisco in December 1897 for sea duty and then transferred to the protected cruiser New Orleans the following April, just in time for service in the Spanish-American War. Barnett's ship joined the Flying Squadron off Santiago de Cuba on 30 May, bombarded the harbor batteries on 6 and 16 June, and captured the French blockade runner Olinde Rodrigues on 17 July. Promoted to captain on 11 August 1898, he transferred to the protected cruiser Chicago in November of that year, serving in that ship during cruises to the Caribbean, the south Atlantic, and European waters. Capt. Barnett came ashore for duty at Marine Corps Headquarters in Washington, D.C., in May 1901. Promoted to major shortly thereafter, Barnett next took command of a battalion that embarked in the auxiliary cruiser Panther in September 1902. The warship sailed to the Caribbean that month, where Barnett's battalion landed to guard the railway transit of the Isthmus of Panama. In January 1903, he took command of another battalion guarding naval facilities in the Manila Bay area of the Philippines. While there, Barnett also served in several ships of the Asiatic Fleet. 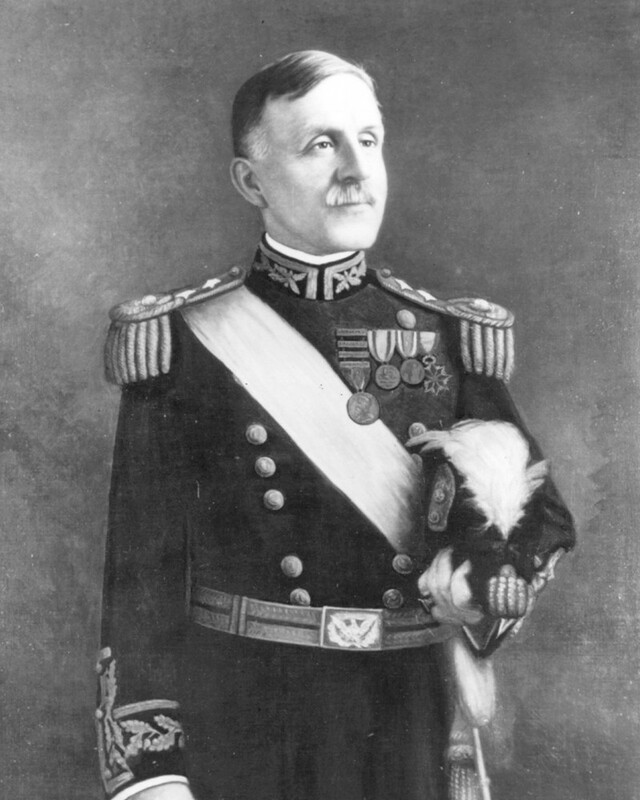 Returning to Washington in April 1905, Maj. Barnett advanced to lieutenant colonel and served as the commanding officer of the Washington Navy Yard Marine Barracks for the next year. When civil war threatened in Cuba in mid-1906, Barnett took command of an expeexpeditionary battalion, later growing to a regiment, in September. 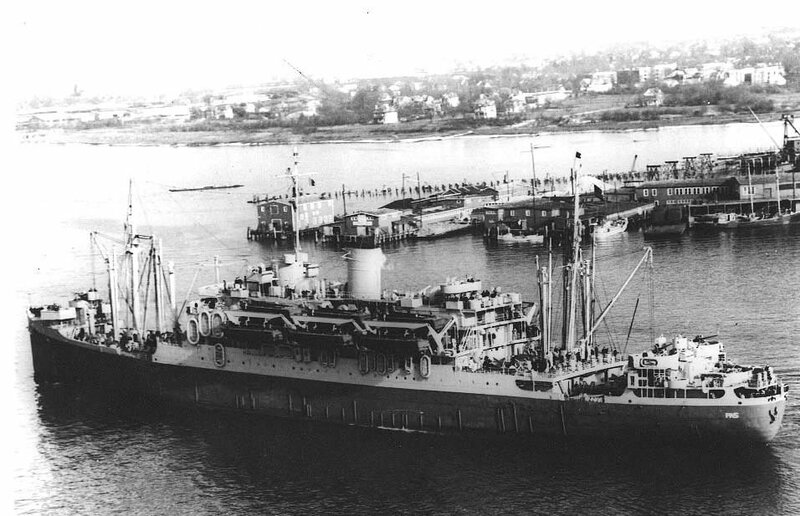 Transported to Havana on board the cruiser Minneapolis, Barnett's force soon moved to Cienfuegos, where it deployed to occupy the towns of western and central Cuba. A large Army force relieved the marines in November, and Barnett returned to Washington in November 1906. After commanding the Marine Barracks for a year, Lt. Col. Barnett took over the 100-man Marine Corps detachment at the American Legation in Peking, China, arriving there in early 1908. He returned to the United States during the summer of 1910 and assumed command of the Philadelphia Marine Barracks, in which billet he received his promotion to colonel on 11 October. Over the next three years, Col. Barnett made repeated deployments to Cuba, in command of the 1st Marines, in order to quell serious domestic disturbances on the island. The most serious of these expeditions took place in 1912, when Barnett took the 1st Marines to Guantanamo Bay on 28 May. Most of the marines returned to the United States by early August. Appointed to a four-year detail as Major General Commandant of the Marine Corps on 21 February 1914, Barnett led the Corps during a time of unprecedented activity and expansion. He worked hard to draw the Marine Corps into closer and more cordial relations with the Navy, directed several important expeditions to countries in the Caribbean, and administered the Marine Corps through its great expansion during World War I. In April 1914, when American forces landed at Veracruz, Mexico, Barnett sent a reinforced brigade of marines to that city. He also stationed an expeditionary force off the west coast of Mexico later that year. When civil wars broke out in both Haiti and the Dominican Republic in 1915, Barnett placed a full brigade of marines in each of these countries to maintain order and keep the peace. 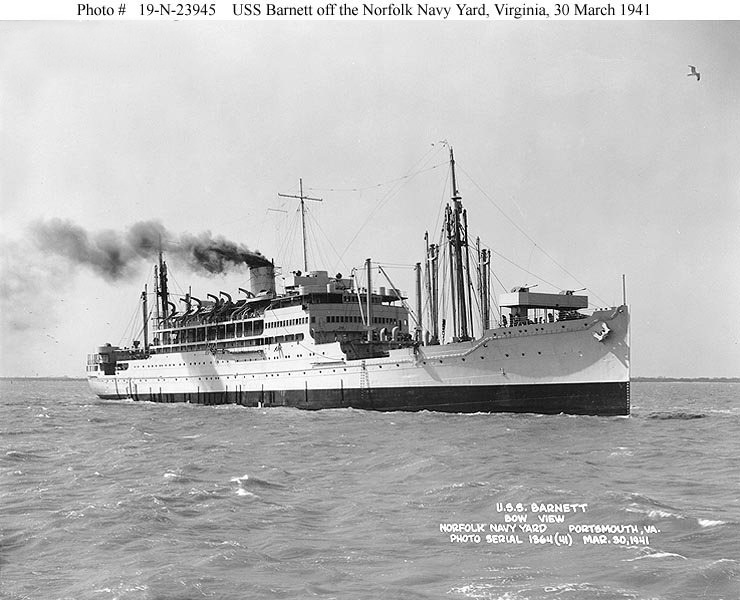 Barnett also guided the Marine Corps as it expanded to 3,000 officers and 75,500 enlisted men during World War I--building training centers in Virginia and South Carolina, sending reinforcements to regular marine stations, and dispatching two Marine brigades to France. Made brigadier general on 29 August 1916, Barnett not only shepherded the Marine Corps through its wartime activities, but also through the difficult period of demobilization and reorganization at the close of the war in late 1918. For his outstanding service, he was awarded the Distinguished Service Medal by the Secretary of the Navy. Relieved as Commandant of the Marine Corps on 1 July 1920, he was given the rank of major general on 5 March 1921. Major General Barnett served the remaining years of active service as Commanding General of the Department of the Pacific. He retired on 9 December 1923 and died on 27 April 1930. Major General Barnett was buried at Arlington National Cemetery. 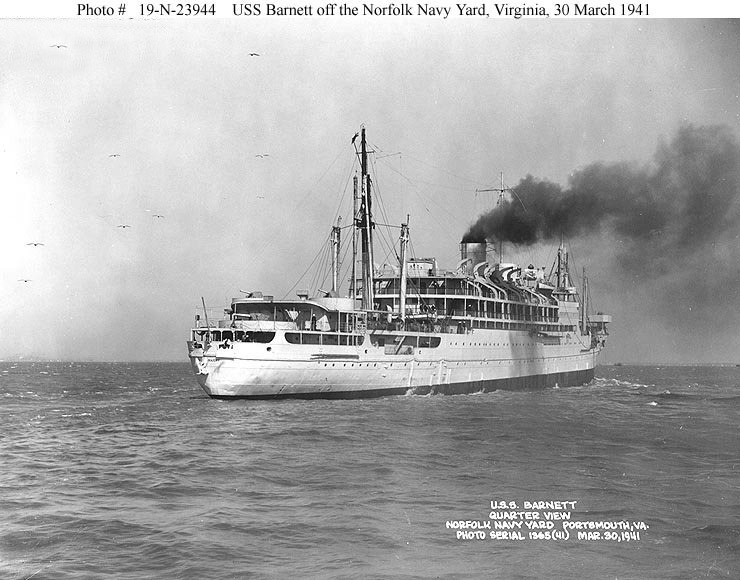 84k USS Barnett (AP-11) off Norfolk Navy Yard, Portsmouth, VA. 30 March 1941. 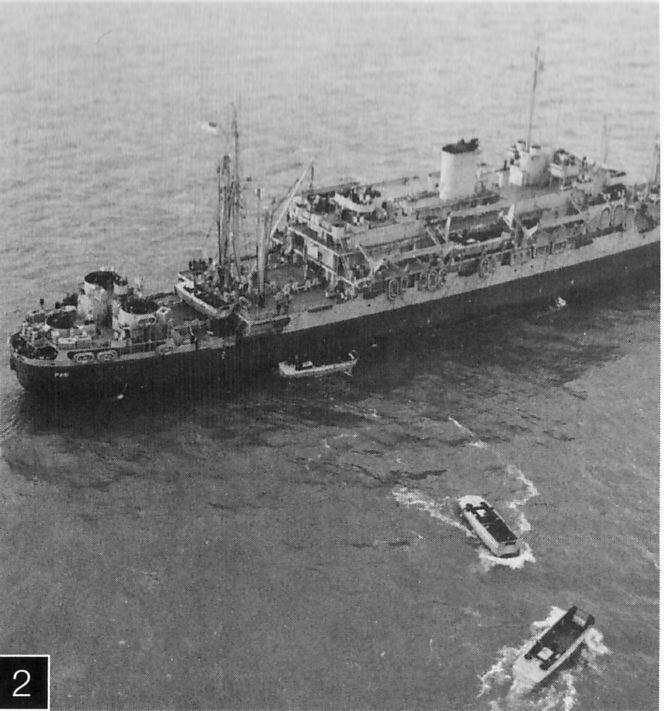 Note the external degaussing cables installed on this ship's hull, and the davits for landing craft on her superstructure sides. 75k USS Barnett (AP-11) off Norfolk Navy Yard, Portsmouth, VA. 30 March 1941. 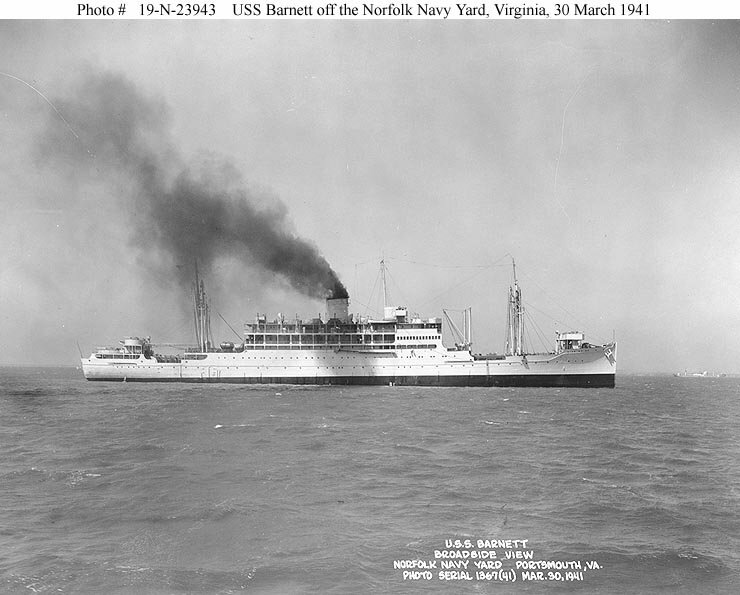 94k USS Barnett (AP-11) off Norfolk Navy Yard, Portsmouth, VA. 30 March 1941. 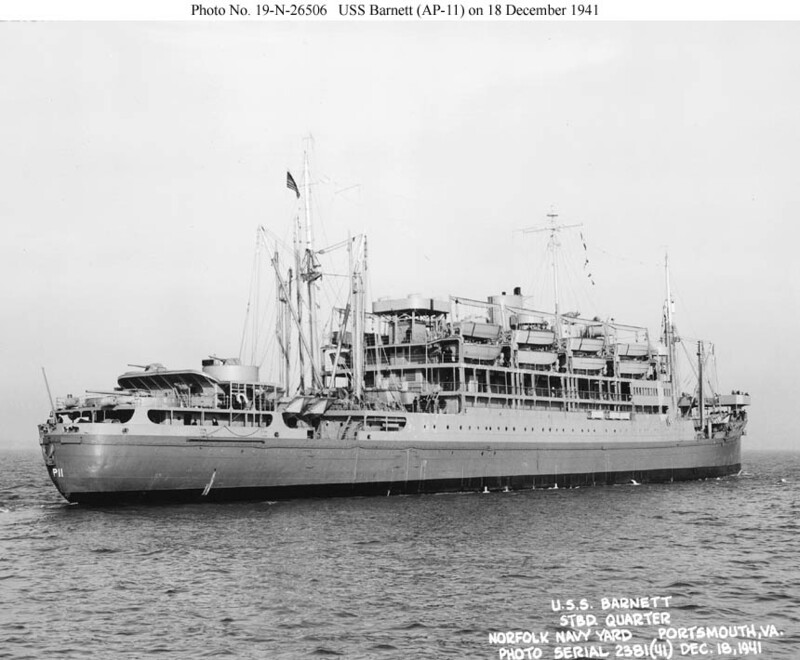 101k USS Barnett (AP-11) off Norfolk Navy Yard, 18 December 1941. The ship has received additional modifications, most notably four new boat davits on each side, each serving two landing craft. 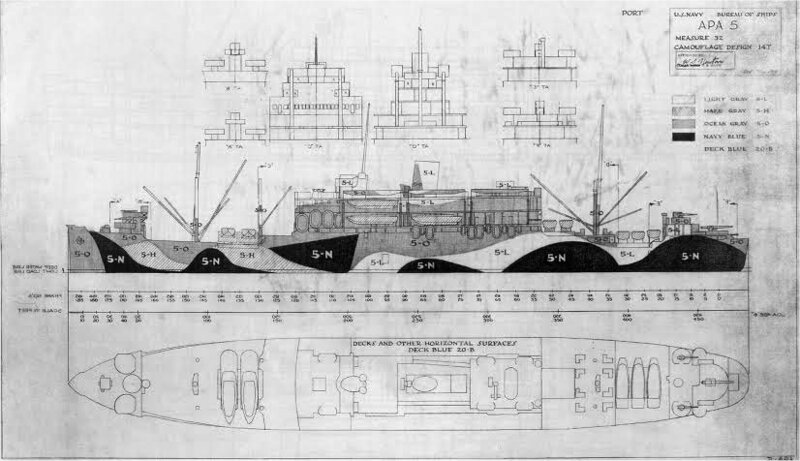 Note her single 5"/51 gun and two 3"/50 guns aft, all with splinter protection. 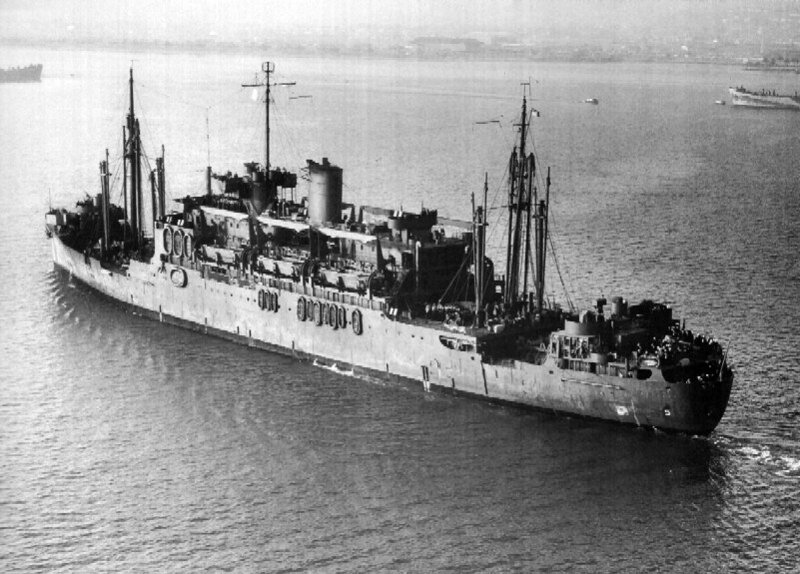 116k USS Barnett (AP-11), date and location unknown. 77k Port side view of USS Barnett (APA-5) class camouflage Measure 32 Design 14T. 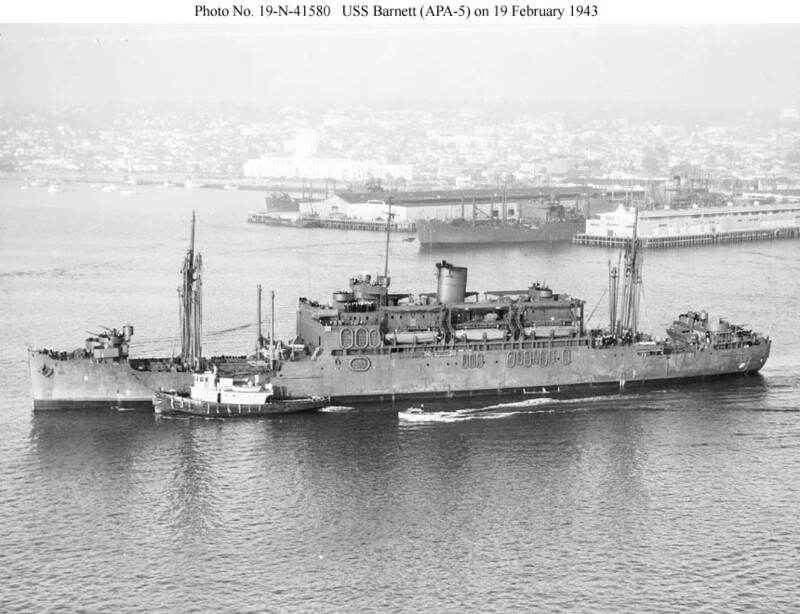 113k After conversion to an Attack Transport USS Barnett (APA-5) departed San Diego, 19 February 1943, enroute to Norfolk, VA. for additional repairs. The four double boat davits fitted on each side in late 1941 have been replaced by three triple Welin davits on each side. The 5"/51 gun aft has been removed and two 40-mm twin mounts have been fitted, one forward and one aft. The nearest ship in the background is probably USS Alcyone (AKA-7). 120k USS Barnett (APA-5) departing San Diego, 19 February 1943, enroute to Norfolk, VA. for additional repairs. 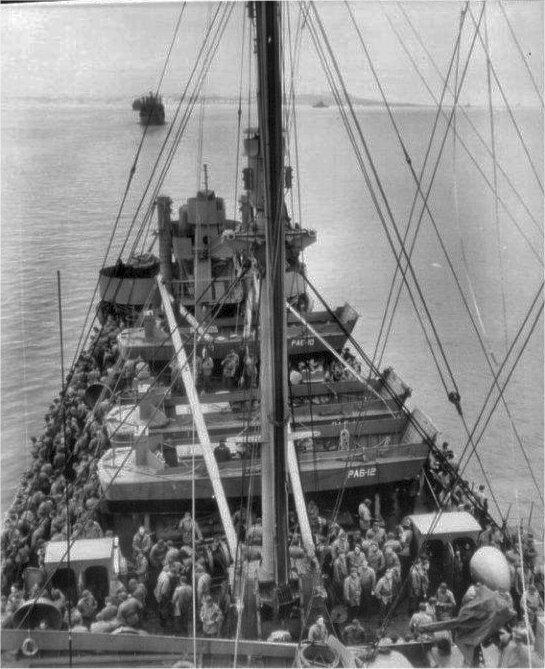 88k USS Barnett (APA-5) in convoy, her decks crowded with troops bound for Attu in the Aleutian Islands, 27 May 1943. 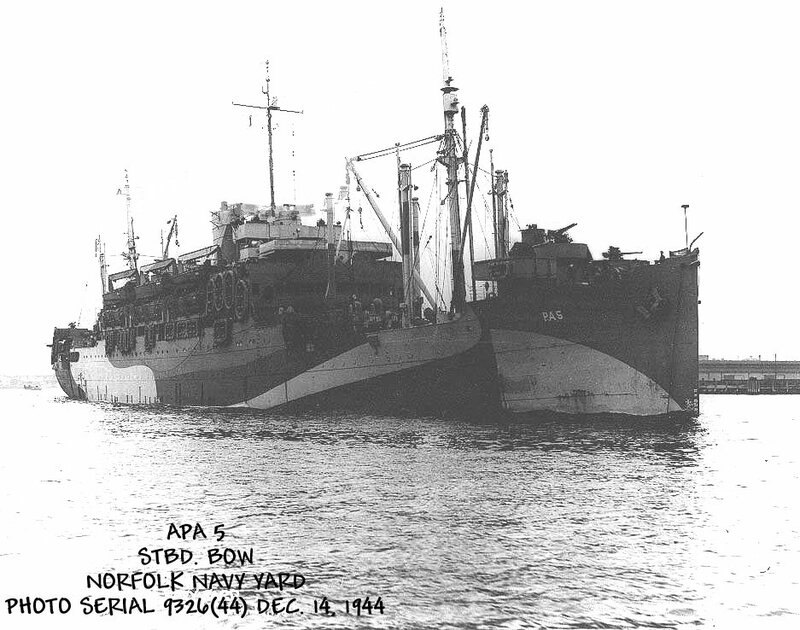 94k USS Barnett (APA-5) off the Norfolk Navy Yard, 14 December 1944. Note the configuration of the armament aft as modified in early 1943, with a twin 40-mm mount on the centerline in place of the 5-inch gun and its director between the 3-inch guns. The triple Welin davits appear to be holding their full complement of landing craft. 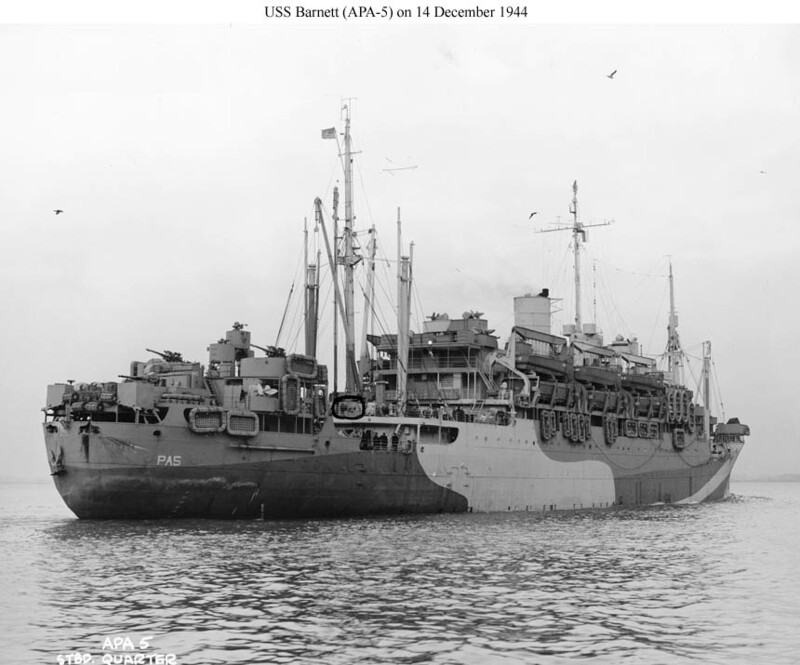 139k USS Barnett (APA-5) off Norfolk Navy Yard, Portsmouth, VA., 14 December 1944. 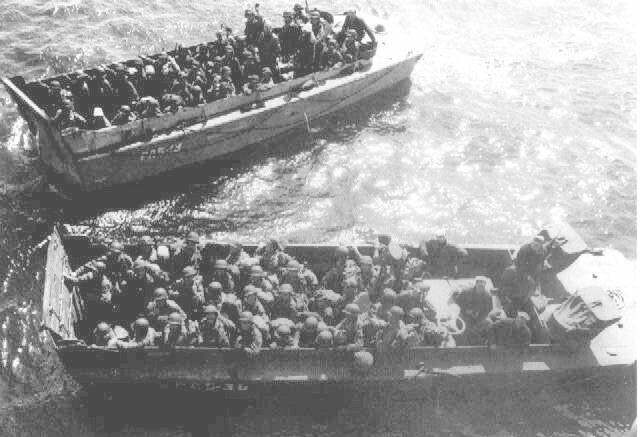 53k Two of USS Barnett (APA-5)'s LCVPs - loaded with troops for the invasion beaches. 79k USS Barnett (APA-5) with LCVPs around her. During the Normandy landings Barnett carried troops of 4th Infantry Division to Utah Beach.